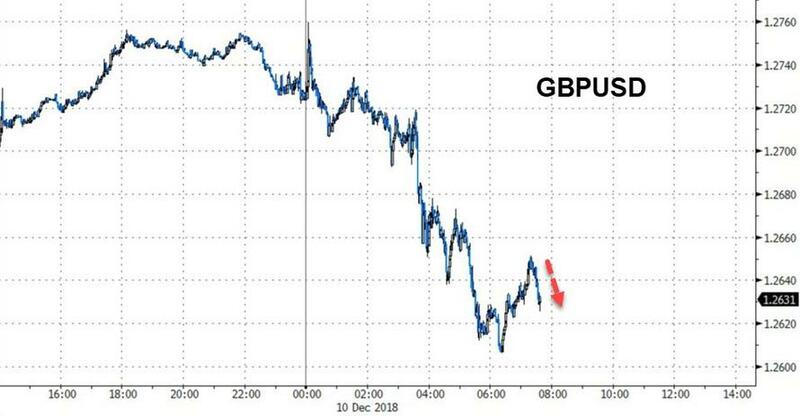 Update 3: Not only will there not be a Brexit vote tomorrow (which should come as a relief to cable pulls since fears that MPs would force a vote helped trigger the pound's downward spiral on Monday) but May has refused to commit to a specific deadline date for the vote, instead insisting that it will only be held once "assurances have been achieved." Meanwhile, EU ministers are saying they won't discuss Brexit at a previously scheduled meeting on Tuesday which...doesn't bode well for May's hopes to deliver a deal-changing "handbagging." The anxieties surrounding May's decision to delay the vote have apparently crossed the Atlantic and driven US stocks to session lows. And lest MPs think that one of their "Plan B" options (like, for example, the "Super Norway" plan) wouldn't be met with so much acrimonious debate, May reminded MPs that any Brexit treaty alternative would still need to contend with the backstop. While taking questions from MPs, May has declined to commit to a specific date to serve as a deadline for the Brexit vote. Update 1: After being greeted by jeers from the House of Commons, May has confirmed that she will be cancelling the vote and returning to Brussels to try and work out a more agreeable arrangement for the Irish backstop that will address the concerns of Brexiteers. The jeers grew louder when May brought up the possibility that a defeat for her deal could mean no Brexit. 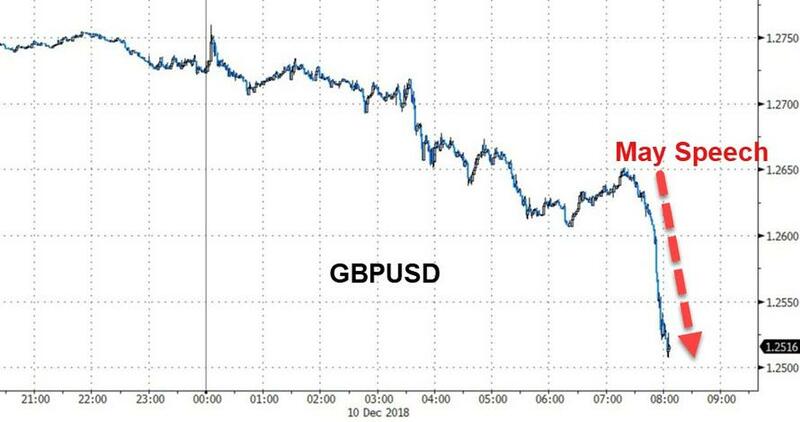 Continuing its downward moment from earlier in the day, the pound is moving lower on May's comments. Here are a few key quotes from May's remarks. "There is no deal available that does not include the backstop." "There will be no enduring and successful Brexit without some compromise on both sides of the debate," May says. "If you take a step back, it is clear that this House faces a much more fundamental question: Does this House want to deliver Brexit?" It's now Jeremy Corbyn's turn to speak: He has said that if May cannot win a workable deal, "then she must make way" (presumably, for a Labour-lead government." Here are a few highlights from the Labour leader's rebuttal. "The government has lost control of events and is now in disarray." A better Brexit deal is "desirable" and "possible"
As we reported earlier, after acknowledging that her Brexit deal faces the possibility of an "overwhelming" defeat in the House of Commons, Prime Minister Theresa May has reportedly finally caved and is expected to call off the planned Tuesday vote in a speech before Parliament.